Recycling Chaos In U.S. As China Bans 'Foreign Waste' The U.S. ships a big chunk of its recycled goods to China. But China doesn't want them anymore, and that's leaving the recycling industry in turmoil. 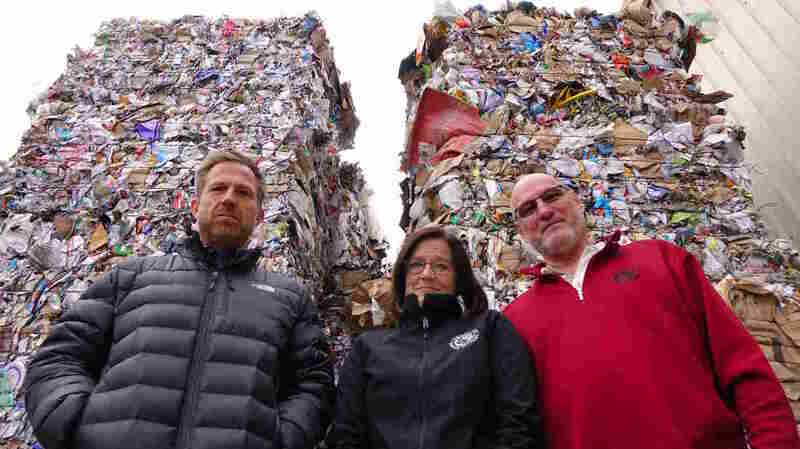 China's ban means recycling is piling up at Rogue Waste System in southern Oregon. Employees Scott Fowler, Laura Leebrick and Garry Penning say their only option for now is to send it to a landfill. 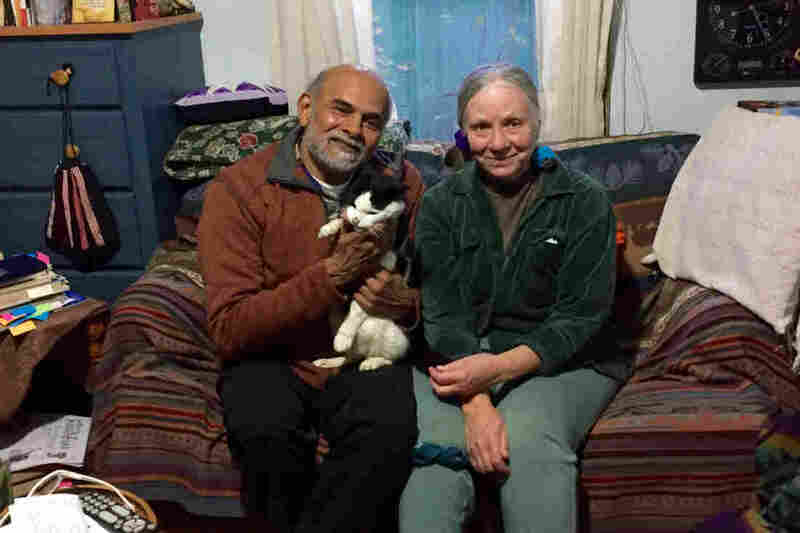 Like many Portland residents, Satish and Arlene Palshikar are serious recyclers. Their house is coated with recycled bluish-white paint. They recycle their rainwater, compost their food waste and carefully separate the paper and plastic they toss out. But recently, after loading up their Prius and driving to a sorting facility, they got a shock. "The fellow said we don't take plastic anymore," Satish says. "It should go in the trash." The facility had been shipping its plastic to China, but suddenly that was no longer possible. Portland residents Satish and Arlene Palshikar want to see the U.S. become less dependent on China for recycling. The U.S. exports about one-third of its recycling, and nearly half goes to China. For decades, China has used recyclables from around the world to supply its manufacturing boom. But this summer it declared that this "foreign waste" includes too many other nonrecyclable materials that are "dirty," even "hazardous." In a filing with the World Trade Organization the country listed 24 kinds of solid wastes it would ban "to protect China's environmental interests and people's health." The complete ban takes effect Jan. 1, but already some Chinese importers have not had their licenses renewed. That is leaving U.S. recycling companies scrambling to adapt. "It has no value ... It's garbage." Rogue Waste Systems in southern Oregon collects recycling from curbside bins, and manager Scott Fowler says there are always nonrecyclables mixed in. As mounds of goods are compressed into 1-ton bales, he points out some: a roll of linoleum, gas cans, a briefcase, a surprising number of knitted sweaters. Plus, there are the frozen food cartons and plastic bags that many people think are recyclable but are not. "It just keeps coming and coming and coming," says Rogue employee Laura Leebrick. In the warehouse, she is dwarfed by stacks of orphaned recycling bales. Outside, employee parking spaces have been taken over by compressed cubes of sour cream containers, broken wine bottles and junk mail. And what are recyclables with nowhere to go? "Right now, by definition, that material out there is garbage," she says. "It has no value. There is no demand for it in the marketplace. It's garbage." For now, Rogue Waste says it has no choice but to take all of this recycling to the local landfill. More than a dozen Oregon companies have asked regulators whether they can send recyclable materials to landfills, and that number may grow if they can't find someplace else that wants them. At Pioneer Recycling in Portland, owner Steve Frank is shopping for new buyers outside of China. "I've personally moved material to different countries in an effort to keep material flowing," he says. Without Chinese buyers, Frank says U.S. recycling companies are playing a game of musical chairs, and the music stops when China's ban on waste imports fully kicks in. "The rest of the world cannot make up that gap," he said. "That's where we have what I call a bit of chaos going on." Adina Adler, a senior director with the Institute of Scrap Recycling Industries, says China's new standards are nearly impossible to meet. The group is trying to persuade China to walk back its demanding target for how clean our recycling exports need to be. But Adler doesn't think China's decision is all bad. "What China's move is doing is probably ushering in a new era of recycling," she says. Bulk Handling Systems is betting that robots can be the future of recycling. At its research facility, bits of waste pass by on a conveyor belt as robotic arms poke down, sucking up plastic bags and water bottles then dropping them into bins. CEO Steve Miller says the robot uses cameras and artificial intelligence to separate recycling from trash "in the same way that a person would do it," but faster and more accurately. "It actually moves at a rate of 80 picks per minute," he says. "A person might only get 30 picks per minute." Miller believes technology like this could let the U.S. make its recycling clean enough for China. But the robots are expensive, and few companies have them. For now, the best bet may come back to the curbside bin. Recycling companies are considering changing the rules for what's allowed in them or adding an additional bin for paper only to help streamline the sorting process. Steve Frank says Pioneer Recycling is even looking into adding cameras to collection trucks to catch people putting trash in their recycling bins.